Image caption King Abdullah has decreed jail terms of up to 20 years for anyone belonging to "terrorist groups"
Saudi Arabia has formally designated the Muslim Brotherhood a terrorist organisation. An interior ministry statement also classified two jihadist groups fighting with the Syrian rebels - the Nusra Front and the Islamic State in Iraq and the Levant - as terrorist groups. The statement gave Saudis fighting in Syria 15 days to return. A royal decree issued last month said any citizen found guilty of fighting in conflicts abroad faced a jail sentence. This is the strongest warning so far to Saudis fighting with extremist groups in Syria. The Saudis clearly now fear similar blowback from having encouraged jihadist rebels there as they faced a decade ago when militants returning home attacked domestic targets. The statement also bans an exhaustive list of activities - including meetings, funding and online communication - that could be seen as supporting such groups. But it goes further, encompassing any activism seen as seditious. The message goes wider too - coming as it does in the midst of a diplomatic offensive against Qatar. Saudi Arabia, the UAE and Bahrain have all withdrawn their ambassadors from Doha in an unprecedentedly public dispute over Qatar's perceived support for the Muslim Brotherhood. Hundreds of Saudis are believed to be fighting in Syria, and correspondents say Riyadh fears they could pose a security risk when they return home. Last month, King Abdullah decreed jail terms of up to 20 years for anyone belonging to "terrorist groups" or fighting abroad. The interior ministry also said the Saudi branch of the Shia militant movement Hezbollah was now banned. The new law also promised tough sanctions for anyone backing the incriminated organisations. However, rights group Amnesty International has criticised the legislation, saying it could be used to suppress peaceful political dissent. Earlier this week, Saudi Arabia joined the United Arab Emirates and Bahrain in withdrawing its ambassadors from Qatar, which it sees as an important supporter of the Brotherhood. The Muslim Brotherhood is already banned in Saudi Arabia, which has long viewed its ideology of populist Islam as a threat. 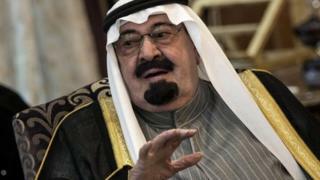 Analysts say the Brotherhood's conservative Sunni doctrines are seen as a challenge to the Saudi principle of dynastic rule. In Egypt, the Brotherhood has been driven underground since the army deposed President Mohammed Morsi, a longtime member of the group. The military-backed government in Cairo designated the Brotherhood a terrorist group in December. Update 13 March 2014: The Shia movement Hezbollah was among the groups banned on 7 March and the story has been updated to include this.